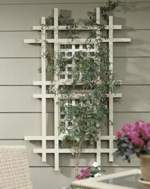 This wall or fence hung trellis dresses up any outdoor area, providing an attractive background for a climbing plant. But the real beauty is in its simple construction. Wood and/or Supplies needed: We used cedar, but you can use a wood of your choice. A full materials list and cutting diagram are included with the plan.